Vol.11 to me is probably the best compilation so far, more good Studio One Rock Steady from around 1967/8. Bobby Aitken with the oriental "El Bang Bang" (El Bam Bam original issued on Island). Great Jackie Mittoo organ with "Tropic Island " and yet another version of "Summertime" on mouth organ by Roy Richards. The Marcia Griffiths track is a bouncy version of "Hold Me Tight" by Johnny Nash. Followed by Owen Gray and a soulful "Give Me Little Sign". Is that the smiling face of Tommy McCook on the cover? This is a good compilation for your collection. 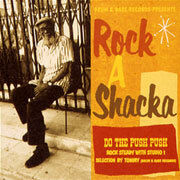 Licensed by DownBeat Records issued on Island Rock A Shacka CD UPCH 1306 Japan. Note Update following the issue of the above CD in Feb 2004 tracks 3 & 4 have now been changed, track 3, Jail House- Mr Foundation & track 4, People Get Ready - The Minstrels. The CD has been repressed with new number UPCI -1009.